how exactly one might consume such a thing. And then there is the issue of what part of the fruit is even edible. 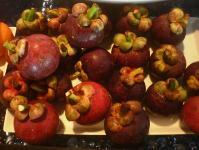 would, without a doubt, prove to be the best fruit I had while out here. 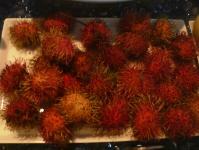 Rambutan - This fruit looks a bit like a sea urchin. This is the one I was referring to that looks like it could poke an eye out. quite tasty. It is rather small and there is a pit inside. 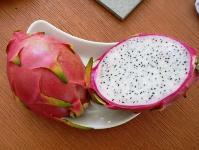 Dragonfruit – This looks extremely exotic on the outside – it almost reminds me of a tropical flower or plant of some sort. fruit is very tasty and looks very cool in fruit salads. translucent and sweet. Very good. Passionfruit – How I love the passionfruit…though I know other people look at these and do not know what to do with them. that you don’t bite down on the seeds.